I can't tell you how happy this weekend makes me. It's the official unofficial start of Summer and Summer is my favorite (Fall comes in at a close second). We have some low key family plans this weekend and plan on hanging and heading to the beach if the weather cooperates. I also plan on sneaking in a little shopping because there are pretty much sales happening everywhere. I'm going to list some of my favorites for you all below! J. CREW:: 40% off all full priced styles and 50% off women's tees, shorts, swim and more with code GETAWAY. Love this coverup and think this is the perfect everyday chambray dress. I also love this sweatshirt. Lila has this little dress and loves it. CLUB MONACO:: 25% off your purchase with code WARMWELCOME! One of my favorite places to pick up high quality staples and I never pass up on snagging something from here on sale. Absolutely love love love these slides and think they are the perfect sandal for summer. This top reminds me so much of a top I bought from Club Monaco last year and wore all summer long. Don't think the short style will work well with my belly this year ;) I need to a new hat terribly. I ordered one a few weeks ago and it did not fit well. Going to give this one a try! ANN TAYLOR:: I dedicated an entire post to this sale yesterday. Everything in the picture above (besides the jeans) are included in the 40% off sitewide sale! MARK & GRAHAM:: my favorite site for home and gifts and 20% off sitewide. I think this would make the BEST wedding gift- who doesn't love a fun yard game? They have the best monogram selection and some awesome Father's Day gift ideas, too! How amazing is this straw tote that you can have monogrammed? And of course love this handpainted one too. ONE KINGS LANE:: Another favorite home shopping site and they are also offering 20% off. I've realized I need more outdoor entertaining pieces. Love this outdoor chair and these dinner plates. A PEA IN THE POD:: 30% off select full priced styles. I just ordered this dress and my favorite jeans in the perfect summer wash are also included in the sale. VINCE:: Take an extra 25% off all sale items with code MDAY25. I know I won't be able to wear this sweater (in heather cloud) until well after baby but I live for Vince sweaters and think they are the most comfortable sweaters ever and hold up so well. This one also looks amazing. 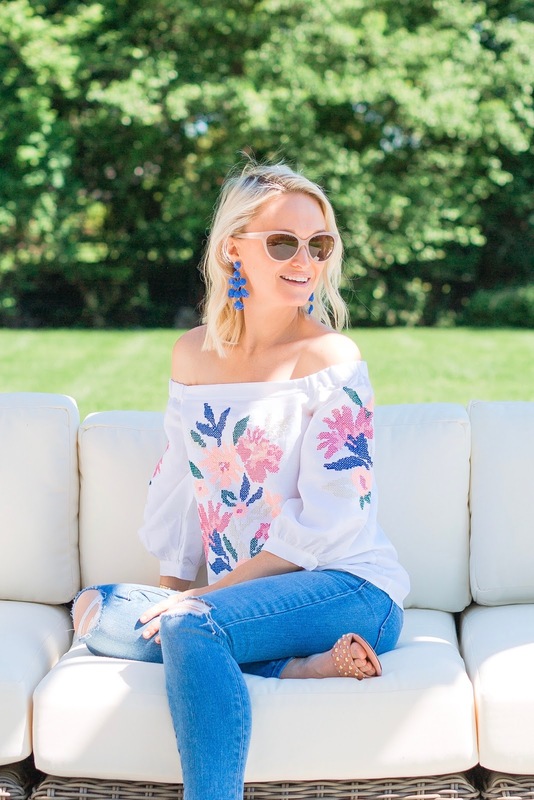 NORDSTROM:: Half yearly sale with up to 40% off- love this easy tee to throw on with jeans or jean shorts for the summer. SERENA & LILY:: 20% off sitewide with code SUMMERDAYS. Every time I check out Serena & Lily I want to update my entire house. I'm currently in the market for some new throw pillows for our family room. Love this one. They also have an amazing nursery selection. I love the modern feel to this crib and the price is not bad at all. How cute are these elephant quilts? I've always loved these baskets- stuff them with toys and put on the top and you are good to go. These pendant lights will give you the summer feels all year long. Obsessed with them. INTERMIX:: 40% off select full priced and sale styles. This is the perfect LWD for summer. Off to take the kids out but I will keep updating this page when more sales pop up! And let me know if there is a site in particular you would like me to do a sale roundup for!